The impetus for BloodyHigh ignited immediately after watching I Am the Pretty Thing That Lives in the House high on Blackwater. I had watched countless horror movies high prior to that evening, but that specific movie/strain pairing blew my mind. So much so that I felt compelled to document the experience. I couldn't wrap my head around if the movie I had just watched was actually good, or only good because I was high. Since then, I've been chasing to find another movie/strain pairing that would produce the same results. Horror movie after horror movie, I felt like my objective was becoming more elusive. That is until I watched The Killing of a Sacred Deer extremely high on some LA Confidential - we're talking between an 8 and 9 on the high scale. I had no idea what to expect from this movie going in. I hadn't read any reviews or watched any trailers. I went in completely blind. I've since gone and watched a couple trailers (including the one I've embedded below) and they all ruin a major plot point. Trust me, the less you know the better. In fact, if you haven't seen it yet you should probably stop reading this review. But damn, if this movie didn't impress the hell out of me! From the opening frame (which I'll get into a bit later) to the closing credits, I was victim to its strangle hold. I couldn't turn away from the deeply disturbing and unsettling story unfolding before my eyes. But just as the way I felt while watching I Am the Pretty Thing..., I kept asking myself during the course of the movie, "Wait? Would I be enjoying this movie as much if I were sober?" Let me just come straight out and say it. The acting is bad. Really bad. But is it? If I were sober I think it may have been something that bothered me. But high, I kept thinking the bad acting was intentional. After all, we have two very capable actors in Nicole Kidman and Colin Ferrell - Academy Award and Golden Globe winners respectively. But in this movie their performances were wooden and lacked emotion. The whole thing felt artificial, like I was watching a stage play. But again, I felt like it may have been an intentional artistic choice by director Yorgos Lanthimos (The Lobster). Contributing to the "stage play" aesthetic was its effective use of cinematography. Yorgos leaned heavily on long static shots that lingered to the point it felt voyeuristic. Super wide angle lenses were also used pretty liberally throughout creating almost impossible looking results where everything and everyone is captured in a single frame - like looking into a dollhouse. It's difficult to describe, but you'll know it when you see it. There's no denying that this movie is visually stunning. All of this, combined with a powerful story and my elevated state of mind produced a psychologically sinister movie experience like no other. Before I dive into the premise, let's chat about the strain I selected that night. LA Confidential is well known indica known for its calming, yet psychedelic effects. Buds are light green in color with orange hairs. Hints of purple are also buried deep in the nugs. The flavor is piney with a strong skunky smell. Hits were smooth both on the inhale and exhale allowing patients such as myself to really appreciate the taste. Pro-tip: Make sure you have your environment complete set before consumption because LA Confidential hits quick and it hits hard. Once the effects take hold, it'll leave you locked in place with zero desire to do anything, let alone move at all. In the five minutes it took for me to down a large glass of water, brush my teeth and hop into bed I was already completely baked. The first minute of the movie begins in complete darkness with only a haunting orchestral track playing in the background. It was at this moment that the psychedelic properties started to reveal themselves. My entire bedroom became cloaked in complete darkness. My body was floating and I felt like I was in space. Scratch that. I was in space. Then from darkness, the movie abruptly cuts to an extreme close up of an exposed beating heart being operated on. It's extremely graphic and disturbing. Most of all, it's effective. I felt queasy and uncomfortable watching this scene - a sensation I would feel over and over again during the course of the film. Steven acts as a sort of father figure by giving him gifts, going out of his way to talk on the phone, and even inviting him to his home for dinner. As mentioned earlier the film stars Nicole Kidman (Anna Murphy) and Colin Ferrell (Steven Murphy) who play parents to Raffey Cassidy (Kim Murphy) and Sunny Suljic (Bob Murphy). Steven is a heart surgeon who has an unlikely friend in an awkward teenager named Martin, played by Barry Keoghan (Dunkirk). It's not immediately apparent the nature of the friendship, but it's obviously suspicious. Martin appears to be troubled with possible mental issues. But Steven acts as a sort of father figure by giving him gifts, treating him out to lunch, making time to talk on the phone, and even inviting him to his home for dinner with his family. The pieces come together later when we learn that Steven performed heart surgery on Martin's father while intoxicated leaving his father dead. These acts of kindness are a selfish attempt clean his hands of guilt and take accountability for his negligence. Things begin to unravel when Steven's son suddenly falls ill. He's taken to the hospital and run through a battery of tests - all of which come up inconclusive. When Martin confronts Steve and says that he's "really sorry about Bob." Steven responds with, "It's nothing serious". Then Martin chillingly replies back, "No, it is," as if he's the one responsible for what's happening. It seems unthinkable, yet somehow he is. Is he a demon? Is he a God? Martin then explains that there's a blood cost that Steven must pay for killing his father. One life for another. He has to kill either his wife or one of his two children. If not, one by one, each family member will become paralyzed from the waist down, eventually refuse to eat, bleed from the eyes, then die. The scene is a punch to the gut. To say this movie is dark is an understatement. The subject matter is every parent's nightmare - to kill their own flesh and blood. Needless to say, things don't end well. This is a movie full of damaged individuals. There are no heroes in this movie, only villains. 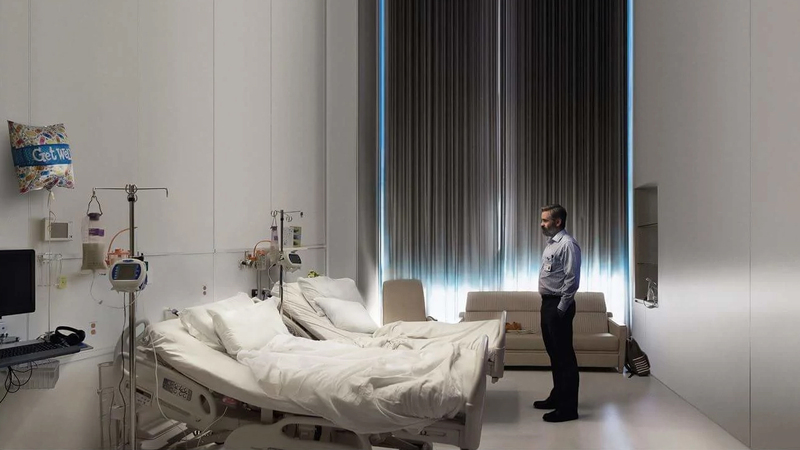 The Killing of a Sacred Deer will surely leave a bad taste in your mouth. Worst still, it'll linger in your mind days after watching it. But that acting! Ugh! I'll stick with my theory that it was an intentional artistic choice. How about you? Have you watched The Killing of a Sacred Deer or tried LA Confidential? What are your thoughts? Did you have a similar experience? Please leave a comment and let me know. And of course, don't forget to follow Bloody High on Instagram, Twitter and Facebook.